This Dark Chocolate, Orange and Ginger Trifle is a dark and boozy delight. Read on to find out how to make it this Christmas. This weekend we had our annual “Thanksgiving” dinner. I put the little “quote marks” around it because we’ve hijacked an American celebration for no reason other than I wanted to host an annual dinner for my family and it seemed as good an excuse as any…In the past I’ve used it as an excuse to cook American dishes – pumpkin pie, pecan pie, bourbon glazed ham, to name but a few. But this year I decided to go quintessentially English with a traditional Beef Wellington and a trifle to finish. I’m not a fan of the classic trifle. Sickly sweet custard (out of a packet…naturally…), strawberry jelly, cream and sprinkles on top. In an attempt to bring some sophistication to this “national” dish I made this Blackberry Trifle with White Chocolate Custard earlier this year. It was such a hit that I decided I wouldn’t stop there, I had to come up with a more wintry version to banish the traditional, tacky trifle from family gatherings once and for all. This trifle is as grown up and as sophisticated as you can get. It’s Christmas, so opt for the highest quality dark chocolate your money can buy when making the rich custard. I’d say no less than 70% cocoa solids, 80% if you can. Whilst it would be great if you could bake your own ginger cake for this it’s certainly not essential. McVities Jamaica Ginger Cake works brilliantly soaked in plenty of rum. Top with rum spiked orange jelly, with stem ginger to give this pudding a real hit of flavour. Build up your layers – with an extra bit of rum here and there – and serve centre stage. Break the orange jelly cubes into a jug and pour over 250ml of boiling water. Stir the jelly until the cubes begin to melt. Add in the remaining 250ml of water (ice cold) and the rum and stir until thoroughly combined. Take the four balls of stem ginger and dice finely. Add these to the jelly along with any syrup. Place the jelly in the fridge. When it begins to set but is still runny progress to building the trifle. To build the trifle, take the first ginger cake and half of the second. Cut them into slices roughly an inche thick and place in the bottom of the trifle dish to create the bottom layer of the trifle. Pour 10 tbsp of rum over the cake and allow to soak. Take the almost set jelly out of the fridge. Give it a stir so that the stem ginger is suspended in the jelly. Pour the jelly over the first layer of cake. Place the trifle dish back into the fridge until it has set completely. In the meantime you can progress to making the custard. To make the custard, begin by whisking the egg yolks and sugar in a large bowl. Next, place the cream, milk and orange zest into a heavy bottomed pan and heat until almost simmering. Add the hot milk to the egg and cream mixture a ladle at a time, whisking thoroughly between each addition. return the cream and egg mix to the pan and heat on low until it begins to thicken. Remove the custard from the heat and add the dark chocolate, stir continuously until the chocolate has melted and the custard is smooth and glossy. Place to one side until completely cool. Once the jelly has set, take the remaining ginger cake and layer on top of the jelly. Pour over another 10 tbsp of rum. When the custard has cooled, pour this over the top of the rum soaked cake and place in the fridge until the custard has completely set. Before serving, decorate with a little cream, some more finely diced stem ginger and a the 50g of melted chocolate. What I love about this trifle is how moody it looks. With the dark chocolate custard, the amber rum soaked cake and golden, boozy jelly. 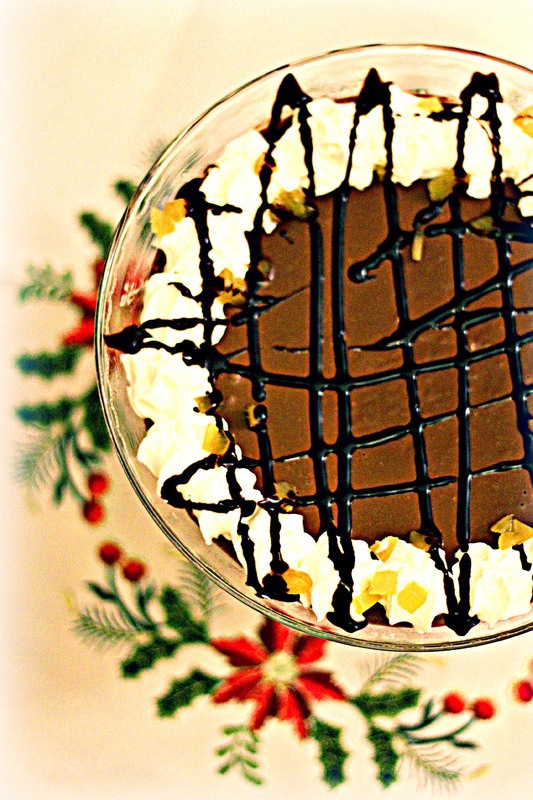 It’s a luxurious pud that is certainly fit for a Christmas celebration. 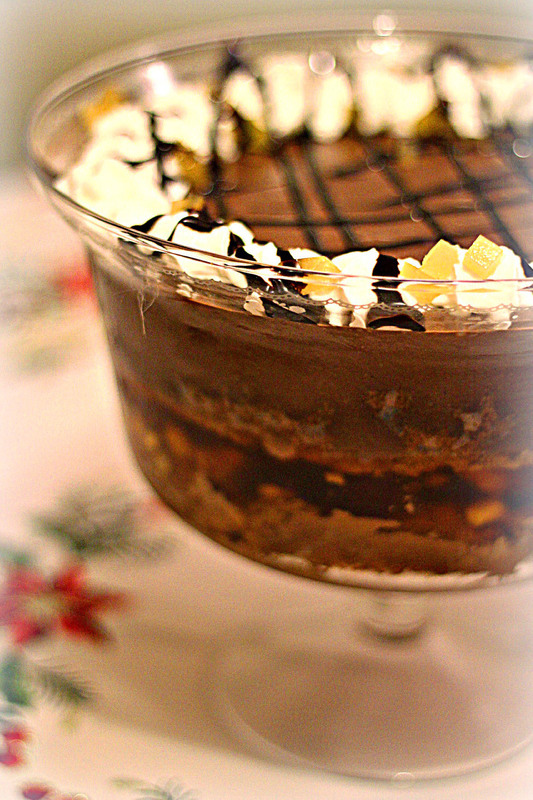 Move over Christmas Pudding – the Dark Chocolate and Ginger Trifle is here! Great idea Emily! Maybe a few little flecks of gold leaf on top could turn it into a real New Years Party dish! Ooooh its like a terry’s Chocolate Orange in a bowl. All the flavours of Christmas. It’s just like that Claire 🙂 you can;t go wrong with chocolate orange can you? Thanks Diana. A trifle is ALL about the textures for me and fresh custard is of course a must. Thanks!